[Updated] The police responded to the Black Watch Pass area of North Shore this morning [Oct 22] after reports of a person floating in the waters, and the police have confirmed that a man’s lifeless body was retrieved from the waters. 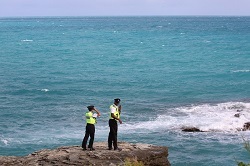 Police Media Manager Dwayne Caines said, “At a few minutes after 10.00am this morning, a member of the public alerted police to a man’s body floating in the waters off of the North Shore, 10 metres east of Black Watch Pass. “As a result, Marine Police were called and the man’s lifeless body was retrieved and is being transported,” continued Mr Caines. When asked for a description, Mr Caines said the man is a dark complexioned black male, between 40-50 years old. Mr. Caines also added that there are no reports of any missing persons at this time. Further details are limited at this time, however we will update as able. Update 1.59pm: A statement from the police said, “A few minutes after 10am this morning [22-Oct] police respond to a report of a man’s body being found in the water off of North Shore in Pembroke 30 meters east of Black Watch Pass. “Upon Police arrival, it was ascertained that a male’s lifeless body was found by a member of the public, floating in the water. Marine Section was called out and the body was recovered. Update 7.08pm: A police spokesperson said, “The Bermuda Police Service can now confirm the death of 55 year old Dennis Eve of North Shore Road, Pembroke. “Details of his untimely death are unclear however, Mr. Eve’s lifeless body was seen by a member of the public floating in the waters off of North Shore Road, just 30 meters east of Black Watch Pass at around 10am [Thursday October 22nd]. “Officers from the Bermuda Police Marine Unit then lifted his body out of the water and into a marine vessel and he was then conveyed to Barrs Bay Park where time of death was certified by a Doctor. “An investigation into the death of Dennis Eve is now underway and Police would like to speak with anyone who may have seen or communicated with Mr. Eve yesterday evening, or the early hours of this morning.